Datagraph comes with a predefined list of Surgery Types. You may add or change own groups as you wish. The labels given in the first column ('your value') will appear on Datagraph-med forms and filters as selectable item and filter criteria. The second column ('your description') contains comments for you to memorize what each label in the value column stands for. You may enter or change your own description here. The third column ('surgery type category') is defining the type of field mask, which Datagraph is going to show. For example, the category 'LASIK' will make fields about flap thickness and flap diameter visible on the data entry form. 'PRK' on the other hand, does not have these fields in the data entry mask. 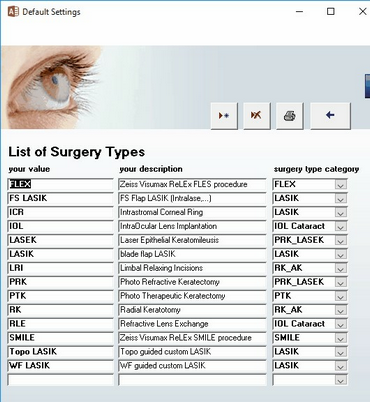 Cataract surgery related fields are displayed only if 'IOL Cataract' is selected as surgery type category. You can add as many different surgery types as you need. Note: during import of older data files which did not contain a surgery type category, Datagraph-med will assign a category automatically. You have to verify and change values and their category if needed.